This is a good reason to prevent noise pollution in your office. In public places the noise trouble is even more directly linked to the business of these activities. In places such as hotels, restaurants, the noise factor can have a decisive impact on their attendance. Sound is an oscillation performed by particles (atoms and molecules) in an element (like air). Substantially a sound source emits a mechanical vibratory movement, it transmits it to the adjacent air particles, which, in turn, starting to oscillate, transmit the movement to other particles and so on. This movement causes a local variation of the pressure in the air ; in this way, a vibratory movement, like that of the vocal cords, propagates mechanically, originating a sound wave. The human ear can hear sounds with frequencies between 20 Hz and 20 kHz. By frequency we mean the number of times a particle makes a complete oscillation in a second. Adults in old age, are not able to hear frequencies above 16 kHz. The acoustic intensity is expressed instead in decibel (db) and expresses substantially the relationship between the power of the sound wave (variation of the sound pressure with respect to the condition of stillness) and the surface that crosses. The ear can also withstand 120 dB for a short time, but in the long run it can also suffer permanent damage if exposed to a sound above 80 dB. The background music makes speech sound less intelligible, if we are not attracted to the conversations of others we greatly reduce the possibility of distraction. The white noise is a noise with no periodicity and with constant amplitude waves. It is called white because if its spectrum is not related to the sound energy but to the visible light we would see it white. In itself it does not exist in nature, but it is the natural sounds like the sound of the sea or the wind that comes close to it, or sounds like the phon, the microwave, the fan, the washing machine. The white noise has a recognized relaxing power and also helps to have a greater concentration, because it covers unpleasant noises. By inserting acoustic panels which, thanks to their high sound absorption capacity, accept sound waves by dissipating their energy into heat and reducing reflection and reverberation of sounds in an environment; By arranging the furnishings wisely, obstructing above all the reflection of the sound in the perimeter corners. 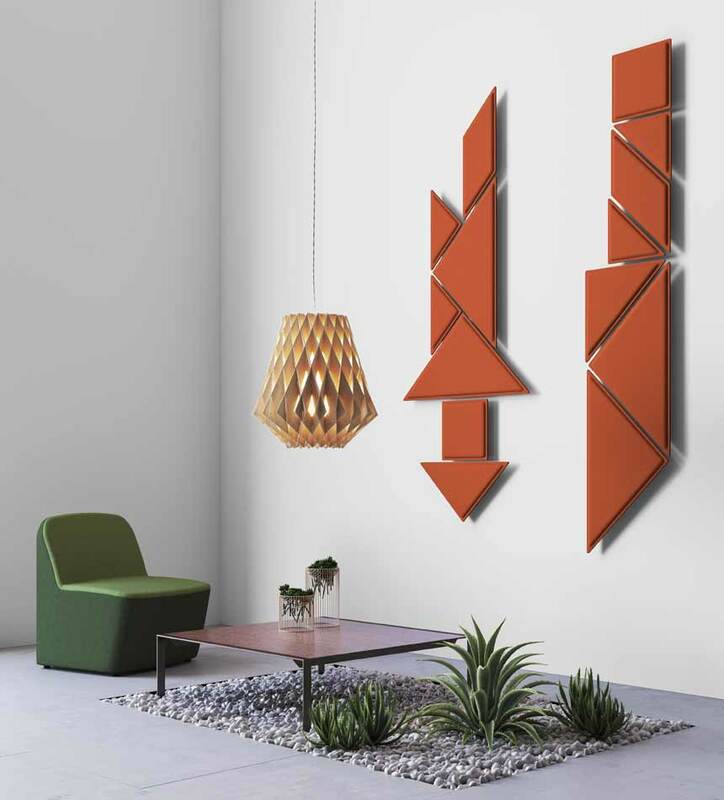 The vertical sound-absorbing panels are available both fixed and mobile on wheels, so that they can be adapted and easily re-positioned for aesthetic or functional reasons. The panels, in addition to performing sound absorption functions, can perform on the walls furnishing functions thanks to the different geometric shapes available and modular and of course the wide chromatic choice of the finishing colors. The sound-absorbing panels are equipped with different types of support that can be hooked to the wall or ceiling. and wanting from heaven to earth. While performing their soundproofing function they can simultaneously define open spaces, constitute visual separation, offer themselves as a piece of furniture that is congruous and consistent with the environment in which they are installed. Example of setting in a refreshment area with sound-absorbing panels alternating with melamine panels that act as a small table. The solution protects from excessive noise in the dining areas, offers small-sized seating places together with a pleasant appearance. Acoustic panels on the glass walls. The acoustic panels can also be applied to the glass partition walls, such as to break down the sound reflection typical of this material and also offer a visual separation of the rooms.